The rain had left small puddles on the road as our convoy of Finns arrived at Wacken 2015 on Tuesday afternoon. However, it was the blowing winds and heavy rain we encountered while trying to set up camp that set the tone for the week’s weather. Luckily, I was staying with a group of Wacken veterans who were well prepared who had a shelter over and around the camp in short time. With some pity for their plight, we extended the camp to also shelter a small group of bedraggled fur-wearing Austrians who had given up setting camp and had resigned themselves to drinking in the downpour. Wednesday dawned to rain, and the steady conversion of the fields of Wacken to mud. My first task of the day was to walk through town to obtain my press pass. 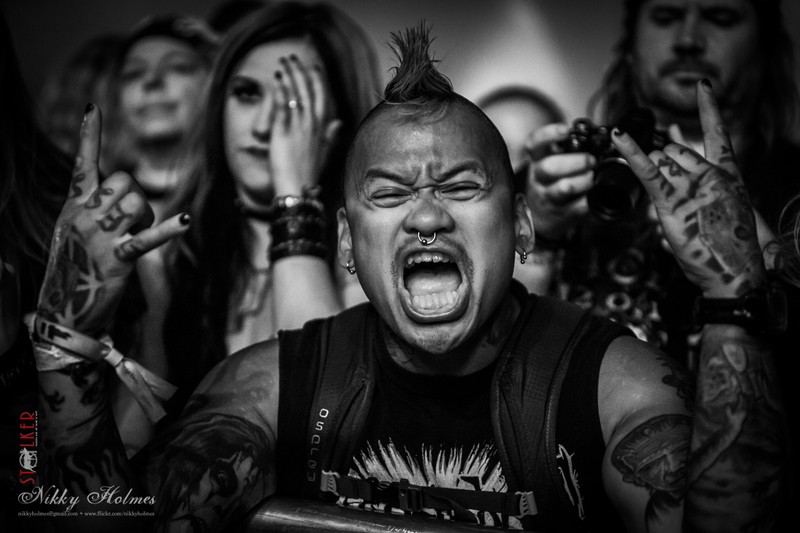 The roads of the town of Wacken were crowded with black-shirted metalheads from all over the world, and the townspeople of Wacken had opened up their backyards and houses to their yearly guests. After getting my pass I stopped at a small backyard café, and was served by two delightful little girls helping their father to pour coffee and fetch breakfast rolls. I speak little to no German, but after wading back across the campgrounds with camera in hand, I knew it wouldn’t matter. 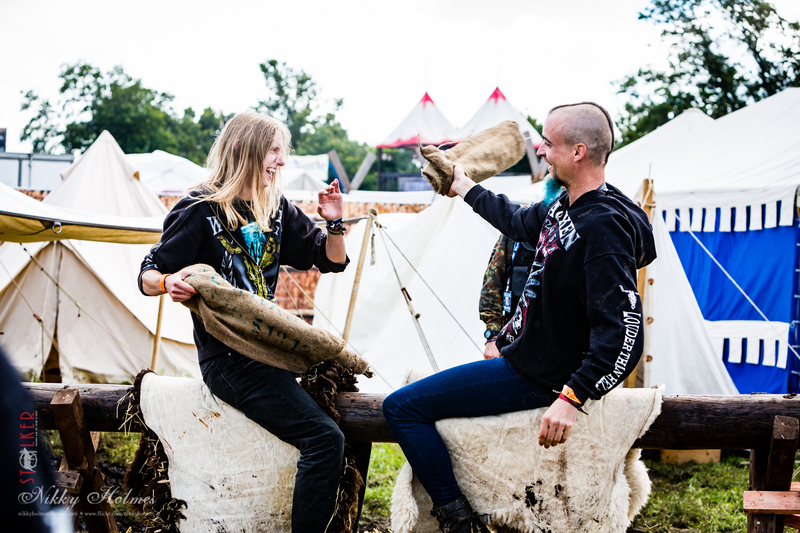 Wacken has a very different atmosphere to the festivals in Finland, but it’s still a massive community of metalheads looking for good music, good times, and keeping grins despite the ankle-deep mud. I wandered around Wackinger Village soaking in the atmosphere of the early festival, as people alternatively soaked up the sun, or soaked in the rain. The costumes were out, and the acts in the village brought a real festival feeling to the small section of the Holy Wacken Land that was open. 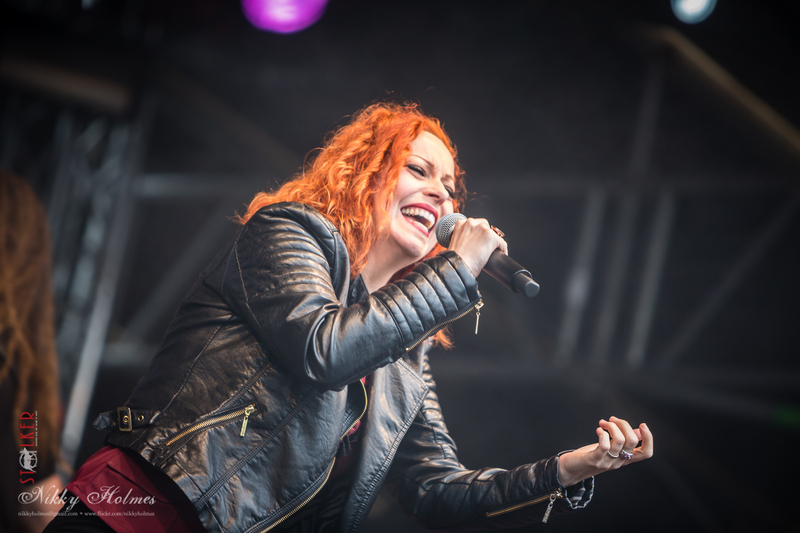 The only main act I saw this first day was The Gentle Storm headed by the beautiful Anneke van Giersbergen play in the pouring rain on the Wackinger stage to a raincoat bedecked audience. I was impressed with the stage presence and skill of live guitarists Merel Bechtold and Ferry Duijsens, and also with the fans dedicated enough to stand in the late summer rain as the chill of the evening set in, in order to see every last moment. Back at camp, the Finns had settled in to drink late into the night, and the Austrians had found their friends… and an axe. It wasn’t long before the axe was wielded drunkenly overhead, destroying their benches for the weekend. This may appear to be a bad idea, but telling fur-wearing barbarians what to wear is probably never a good idea. Thursday brought the ankle-deep mud in some areas to mid-calf, and the reality of how wonderful the shower-tents really are. There is nothing quite like hot water (even if it only lasts 10-15 seconds at a time) after being soaked through to the bone. The gender-separated communal showers may not be a shock to most mainland Europeans, but I encountered a couple of very uncomfortable British girls showering in their swimsuits. My first task of the day was to see how well Austria presented itself in the Metal Battle. Silius hail from Landeck, and play Pantera-flavoured Thrash metal with an unforgiving violence. Though opening the Headbangers Stage on Thursday meant the crowds lacked the metalheads still queuing outside for their tickets (or sleeping off a hangover… or stuck in the mud), Silius put together a great set with a decent crowd who managed to get some pre-lunch moshing enthusiasm. I stayed through the set and shot some photos from the crowd, before seeking out friends, and sampling the flavoured wine mixers the Germans are so fond of. 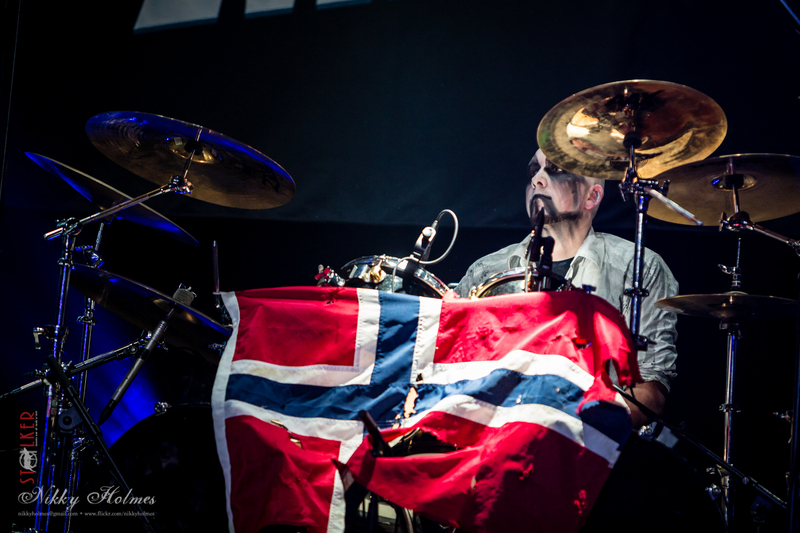 From Denmark this year, the Metal Battle sent Savage Machine with a good dose of Old School Heavy Metal. 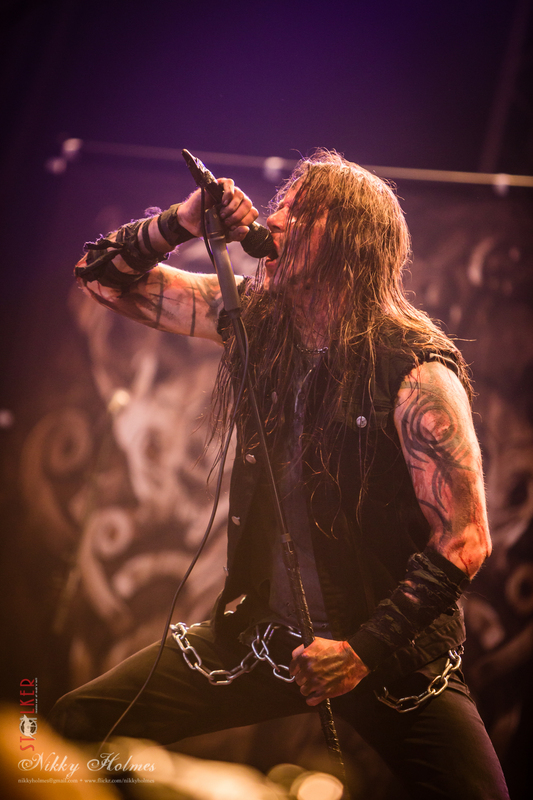 With a strong sound, and an obvious glee at being onstage at Wacken, the Danes were prepared with a full-set of solid riffs to win them new fans in the mud-encrusted crowd. Outside in the Wackinger Village where Knasterbart played, constant rain had a crowd decked in raincoats, plastic bags, gumboots and duct-taped. 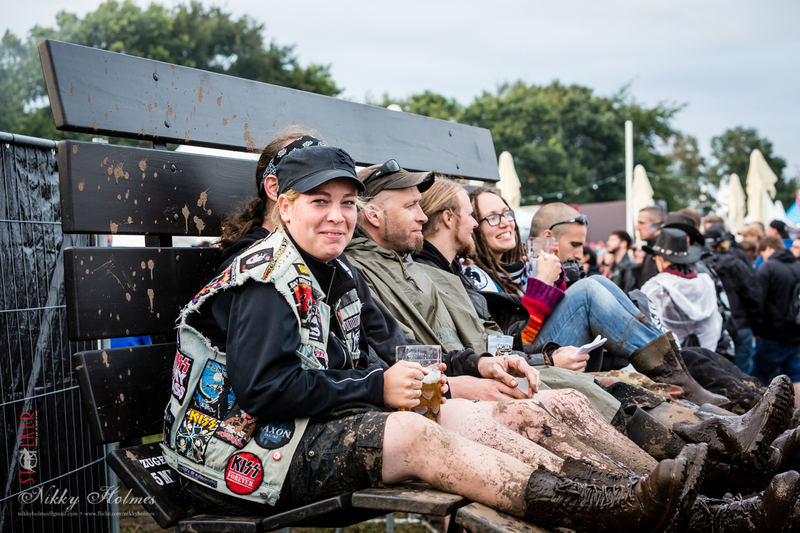 They sloshed through the mud without hesitation, usually with one of the plastic Wacken drinking cups clenched in hand, and a matter-of-fact acceptance that summer festivals in Germany often lead to mud. 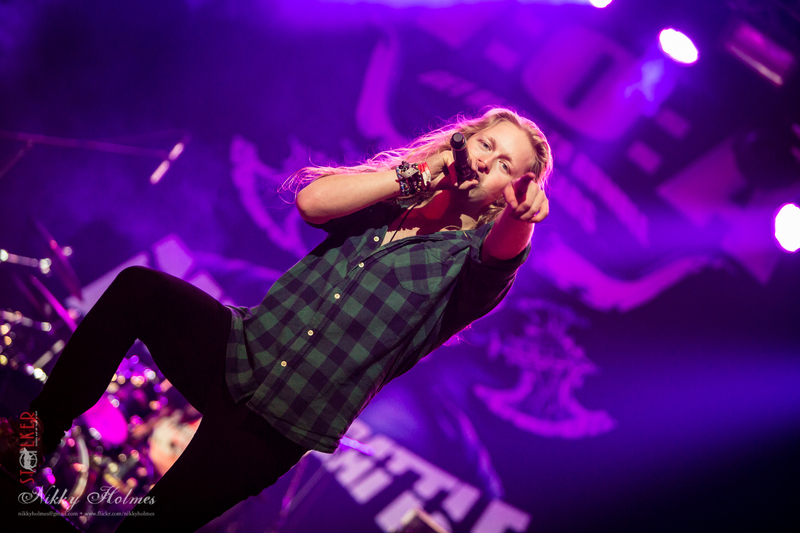 Earlier this year in Finland’s Nummirock, I saw Shiraz Lane accept their win of the Finnish Wacken Metal Battle. Now these enthusiastic Finnish youngsters own the Headbangers Stage at Wacken like there had never been a doubt they’d make it. Drawing quite a large crowd, and more than a few front row holding young female fans, these Finns set out to spread their 70s styled “Peace & Love” Hard Rock to mainland Europe. Imagine a young, fresh-faced and uncorrupted Motley Crüe more interested in opening your mind than singing about Girls, Girls, Girls and you’ve got a hint of what these boys have to offer. 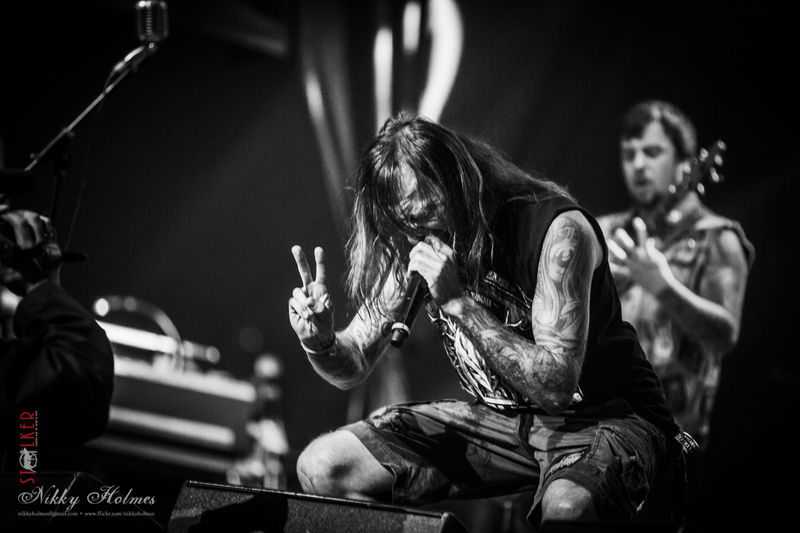 Did you know China has a Wacken Metal Battle representative? I admit that I didn’t until I read the program. The metal community in China are just as passionate as the rest of the world, and I know how warm they are to European bands who make the trip to play there, so I wanted to see how the European reception to a Chinese metal band would be. 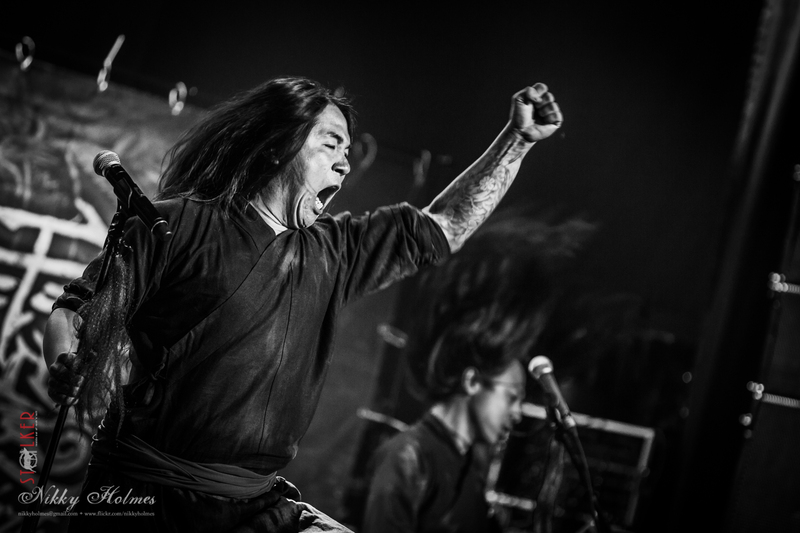 As it turns out without doubt, I’d have to say that Dream Spirit (梦灵) were the standout Metal Battle band for me this Wacken. They were for several people I talked to in the crowd as well, who were more than impressed with the mix of traditional Chinese folk and heavy metal that roared from these musicians. 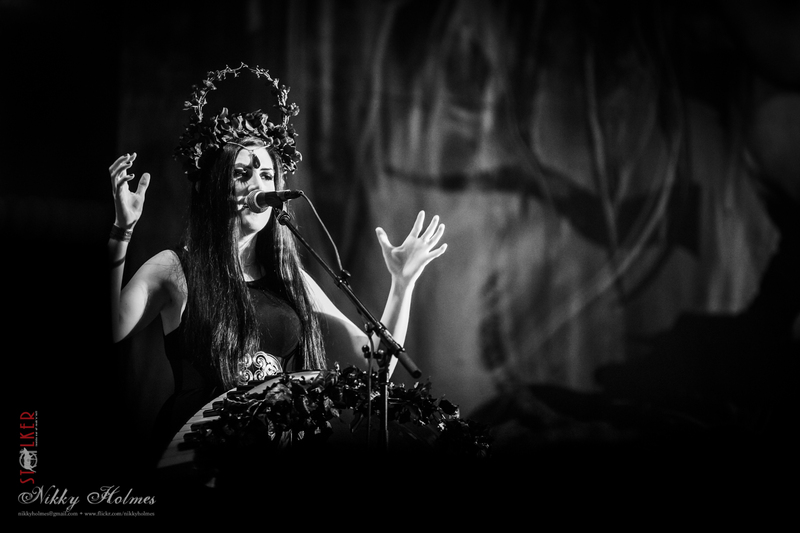 Heavily influenced by the dark side of the Norwegian Folk Tales, Troldskugge put together a dark and bewitching performance as Norway’s Metal Battle representatives. With a nod to the Norwegian Black Metal scene, Troldskugge have a taken a step to the side to infuse their music with a little of a pagan influence steeped in appreciation of the beauty of their land. Well at least, that’s what I could gather from research and their performance. I’m still not sure about the bag over the singer’s head. It made me think a little of a certain Batman villain. 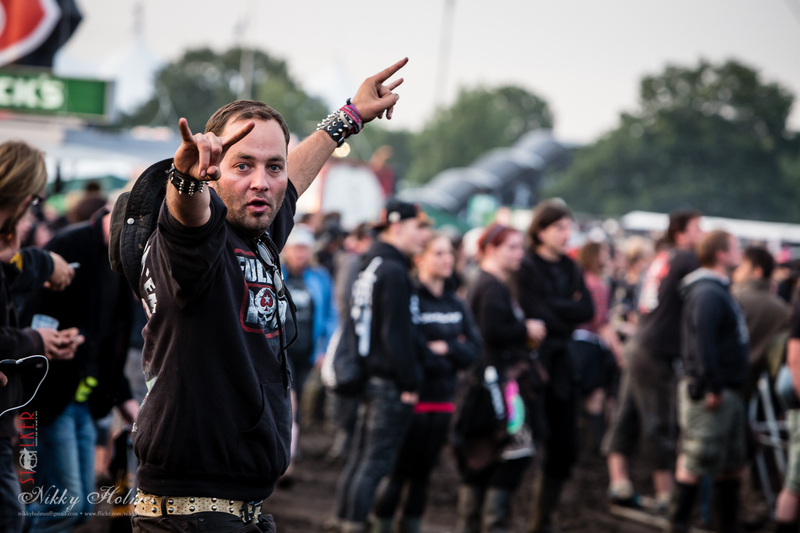 After an afternoon of metal, I decided to get to what wanted to do most at Wacken, photograph the crowd of metalheads who come here year after year in rain, mud and dust. 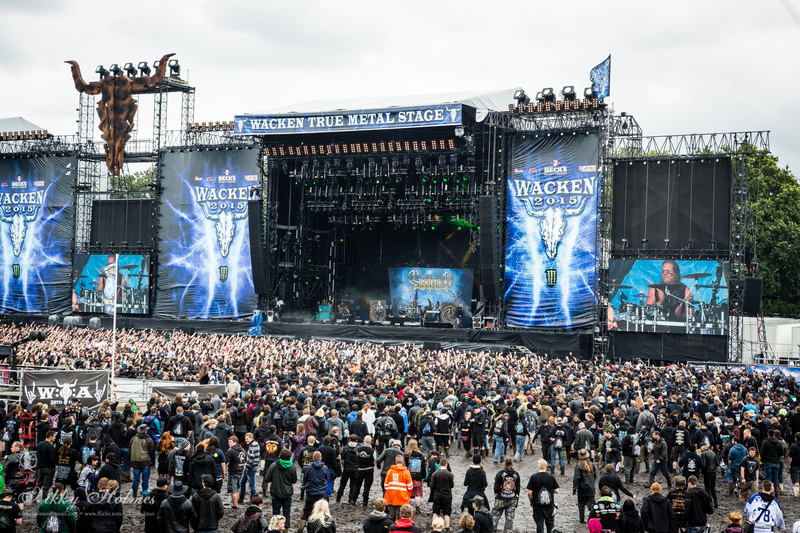 Wacken often sells out within hours of tickets going on sale, and many visitors have numerous Wacken’s to their name. 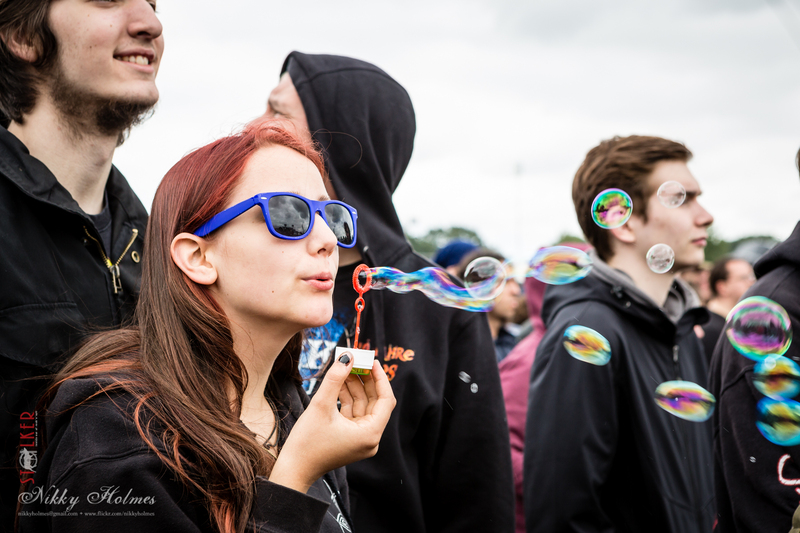 Wacken tickets are hot commodities online in the months before the festival, and people travel from all over the world to soak in the Wacken spirit. Quite literally soak some years. Some groups prepare costumes to stand out, and possibly to find each other in the massive crowds. I met Germans, Austrians, French, Australians, Brits, Irish, Americans, Czechs, Poles, Belgians, Dutch, Swiss and many more. Wacken is truly an international festival, even if sometimes it seems entirely populated by German speakers. In the Holy Wacken Land, the stalls of the Center were doing fast sales on gumboots, raincoats and hoodies. It was here on, late on the second day that I started to encounter army boots abandoned to the mud. Their owners were either wandering around barefoot, or had swapped them for gumboots and decided that there was just too much mud to save their old army boots. Massive the crowd was indeed for the double act of Savatage and Trans-Siberian Orchestra. The rain did not deter the fans of these legendary bands. I was lucky enough to be admitted to the pit for a couple of songs, but sadly could not get close enough during my songs to capture Jon Oliva. Also, I would have had to be as wise as some regular Wacken photographers who brought stools to stand on if I wanted to capture Jeff Plate behind the drums. However, I could hear it all. 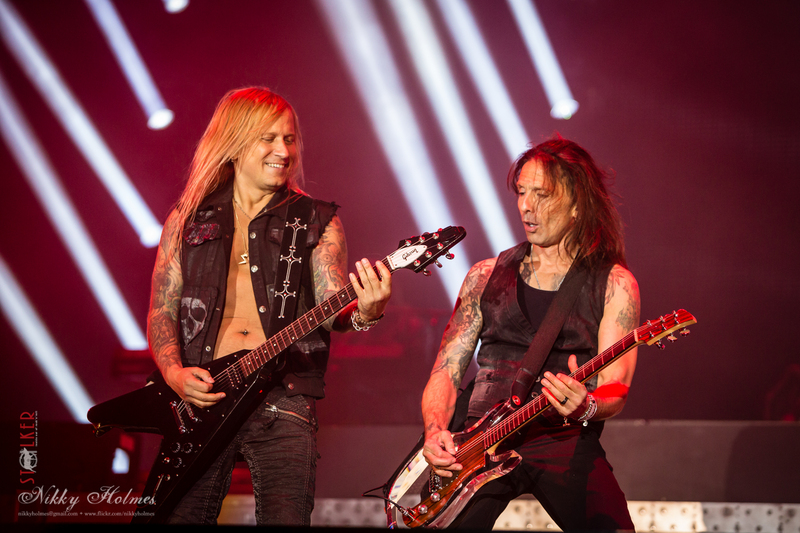 And if you’re a Savatage fan that missed this short set? I am so very sorry for you. Passion and talent unmarred by their long hiatus rang out from the Black Stage. Zachary Stevens voice was smooth as he entranced the audience with Edge of Thorns. 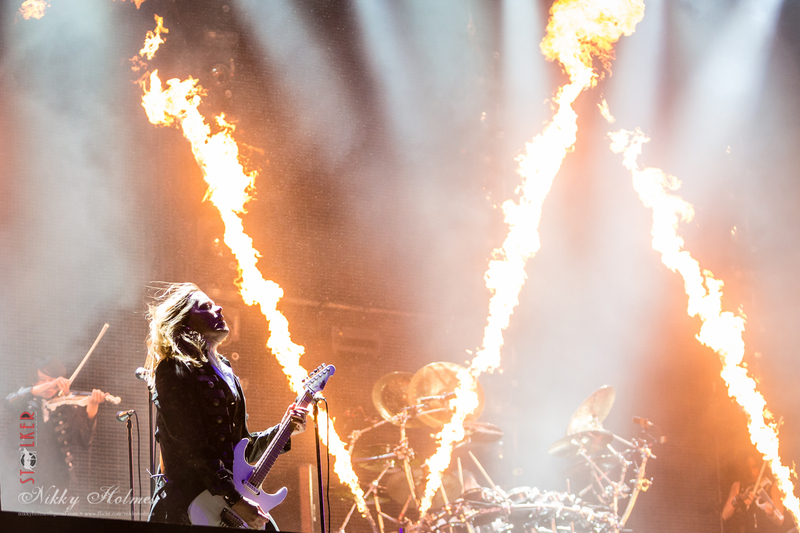 Wrapping up with Hall of the Mountain King, the crowd roared out their approval as the stages swapped and the Trans-Siberian Orchestra brought their magic to the sodden crowds of Wacken. 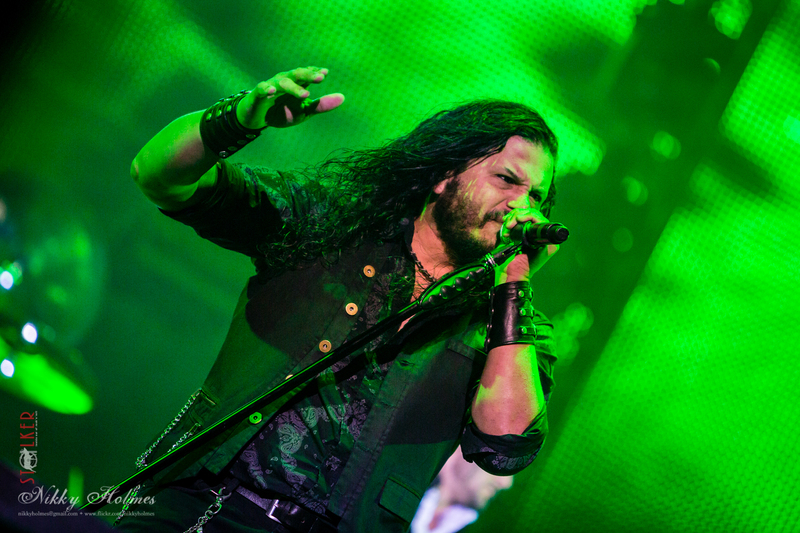 I was able to be in the photo pit for Jeff Scott Soto singing a brilliant live version of Another Way You Can Die, and was also very impressed by the well choreographed synchronization of the backing singer’s movements. What really knocked me off my feet though was Kayla Reeves’ voice the second she let loose at What The Night Conceives. She has a rich tonality edged with soul that can transfix as it flows with pure emotion, and a whole lot of talent. The Trans-Siberian Orchestra really know how to choose their musicians, and I think the passionate response of the crowd to their whole set echoes this. 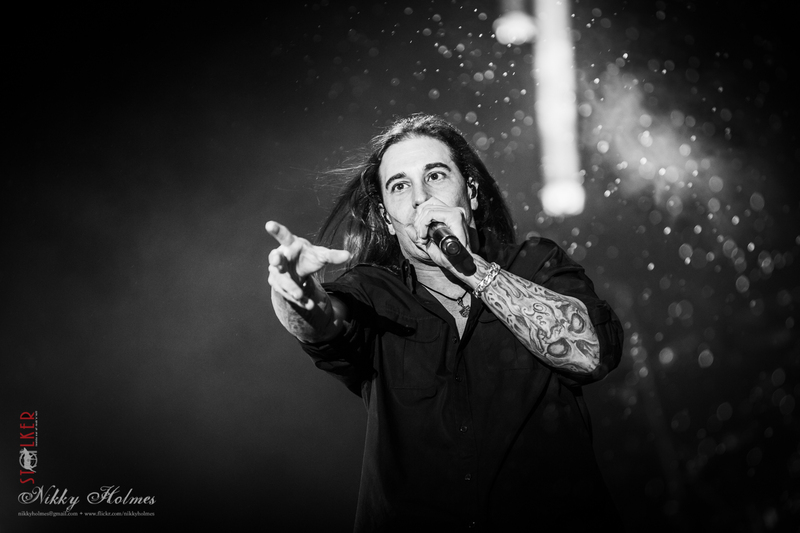 The rain continued on and off throughout the night, and the slow churning of feet would turn large swathes of the Holy Wacken Land to a chocolate pudding like consistency for Friday morning. As Ensiferum played, I sought refuge on top of a Jägermeister hut while below people sludged through the Wacken swamp. There is a very good reason why the Wacken raincoats declare “After the Rain, Comes the Mud.” However, it didn’t seem to dampen spirits as I spotted many moshing happily in the mud for Sepultra, with the crowd-surfers in full force. My first band duty of the day was trying to capture the insane brilliance of Kvelertak. Though I was sad that the owl-hat didn’t make an appearance, the sun was out and shining hard for the Norwegians set as they delivered a powerful opener to my day. This heavy metal band delivers high melody songs that can uplift any mood overlaid with passionate punk styled throat ripped vocals. I’ve never seen them to disappoint live, and their Wacken performance drew crowds nearby to dancing along. I will admit to dancing out of the photo pit when it was my time to leave, which I think amused the otherwise straight-faced security very much. Now I love At the Gates. I do. They are probably one of my favourite bands. However, something was wrong with their live sound at this year’s Wacken. Maybe I’m just horribly biased due to all the times I’ve heard them sound amazing, but the Finns I was with agreed with me. However, close to the stage this didn’t hinder the moshing at all, and I could tell that this wasn’t for lack of the band putting on their customary amazing show. Sometimes something just doesn’t go right, and sound over such a large area is very different to get perfect. I’d promised a friend that I would take pictures of his beloved Annihilator, so I did. 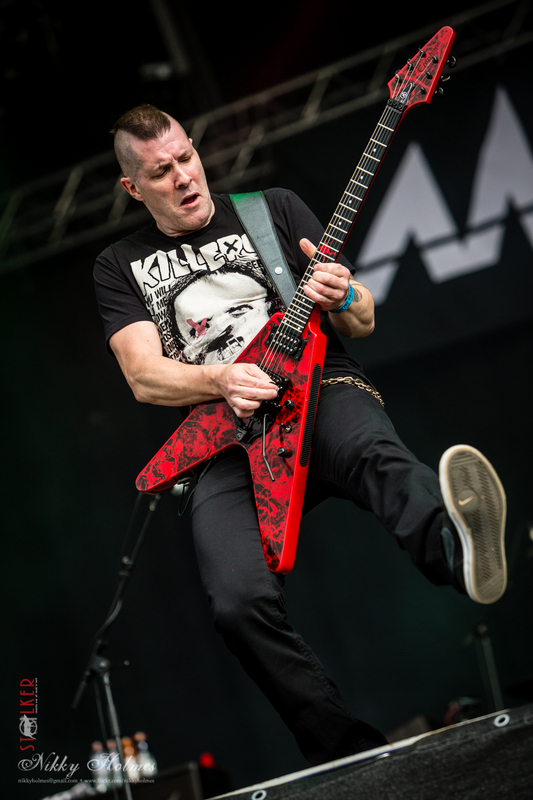 More than ever, these days Annihilator is a vehicle for all of Jeff Waters’ talents, though I do have to say I’ve never been a massive fan of his vocals. However, his stage presence is charismatic, and his guitar playing remains brilliant. 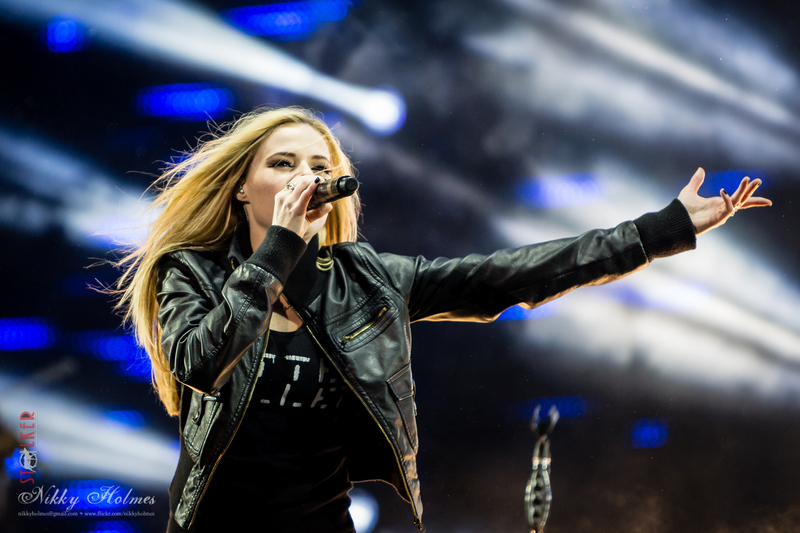 In fact, the whole stage presence at Wacken was very visually choreographed to accent Water’s presence. The guitars were all red, and his live guitarist and bassist both wore chin beards with their long wavy dark hair. 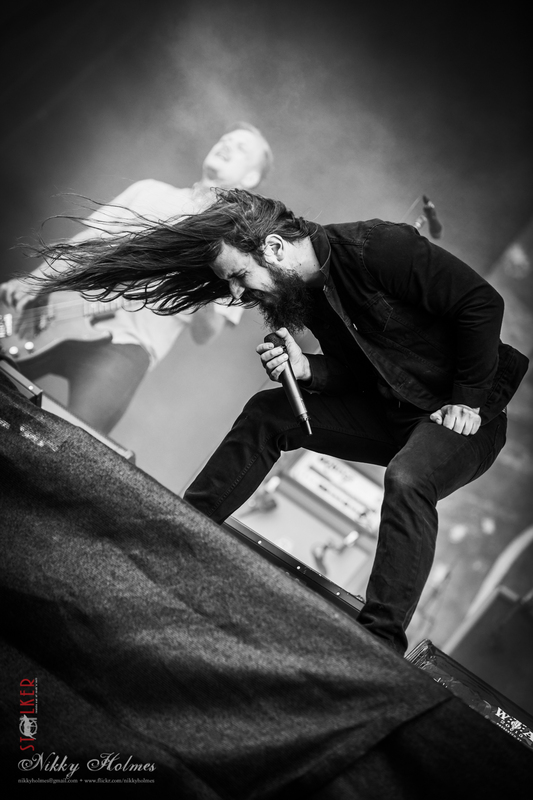 This aside, the live energy and charisma of Annihilator shines through, even against the fierce sun and deep mud they faced. I hurried across Wacken to catch a few songs of Birmingham’s Anaal Nathrakh before watching the entire set of Thyrfing like a giddy schoolgirl. I wish I had been able to catch more of Anaal Nathrakh, as their unapologetically heavy sound was in good form, and even had people crowdsurfing in the crowded tent stage area. As for Thyrfing, the swedes’ set was passionate, strong and swept me off my feet. I am unashamedly biased about this as Thryfing are one of my favourite bands, yet I think from the reaction of the crowd and the many people singing along with the lyrics that I was not the only one. Wrapping up my day with the camera, I went to see Mister Zakk Wylde and his Black Label Society. Black Label Society are more than just a band to many of their fans, producing a cult-like following of the former Ozzy Osbourne guitarist. 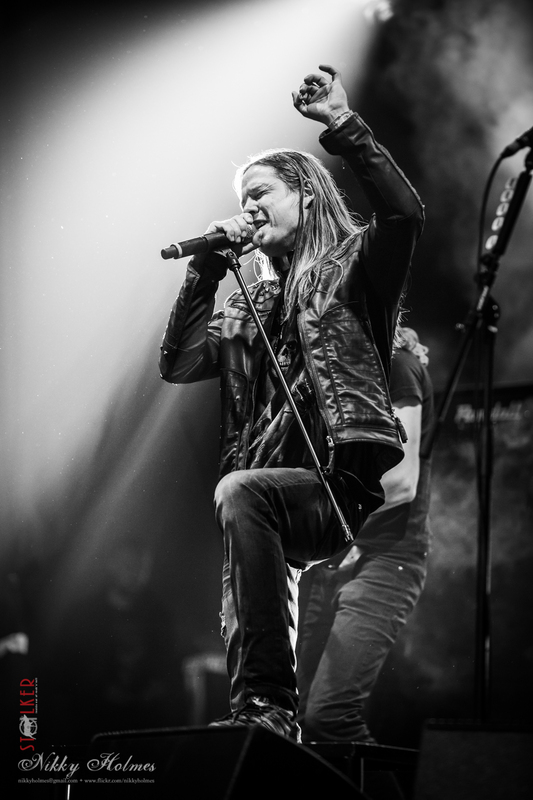 Wylde sets no illusions to why this is with his strong performance, skilled solos and dominant stage presence. 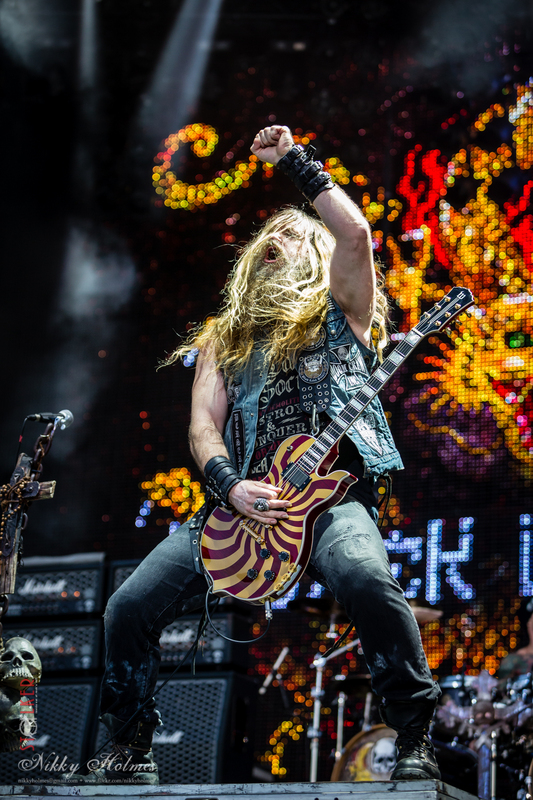 When Wylde is on stage, it’s very hard to look elsewhere as he echoes back to his crowd all the energy and appreciation they are flinging towards him. There were some very happy metalheads basking in the front row, and more than a few BLS patch jackets dotted throughout the crowd. I listened to much of In Flames and Running Wild from our well positioned campsite, sitting back in a camp chair and enjoying the dryer German summer evening. As it got later, the mist crept up through the tents, and the sounds of partying flowed around us. 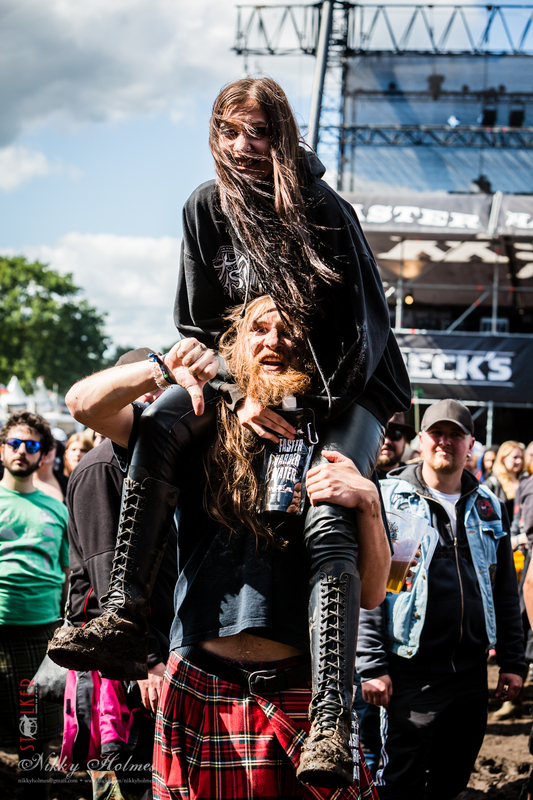 For some, Wacken is about seeing all the bands you can. For others, it’s about balancing as many as you want to see while still having time to sit and share a drink with new and old friends. As I knew my last day of Wacken would be one of my busiest, I chose the latter option that night. The sun of Saturday gave a beautiful day, even if the ground was now covered in steadily thickening mud. 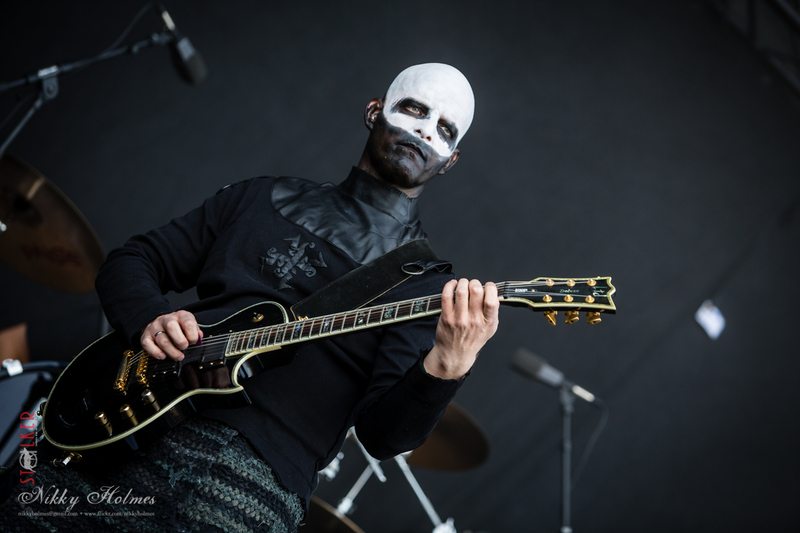 Some dryer patches had reached up, and raincoats were discarded as a beautiful day presented itself for Khold to open up the Black Stage with their characteristically melody thick riffs punctuated by Norwegian Black Metal sneers. 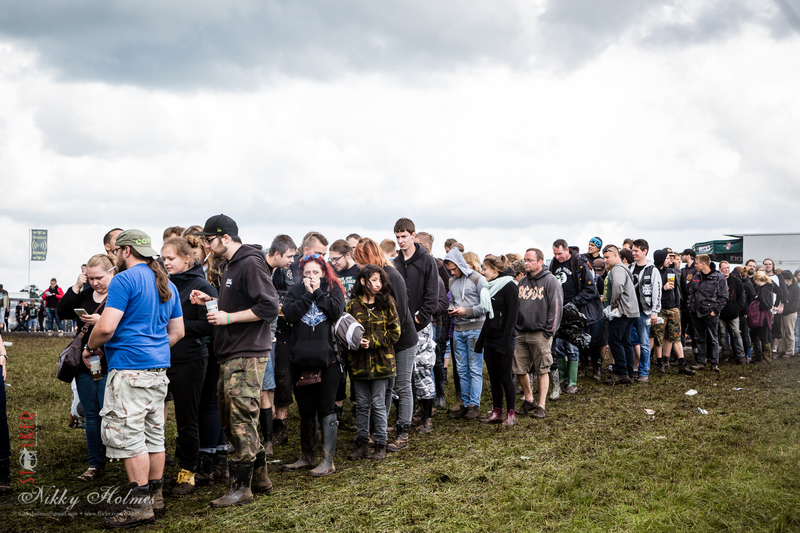 It was a slow start in some areas of Wacken as people tired from all the trudging through the mud, and waited for the energy that only comes from a dozen beers (or a very alcoholic milkshake) to fill them… or just the right band. The right band to restore my last-day of Wacken energy was Sweden’s Avatar. Presenting all the stage theatre of a crazed circus ring, Avatar also deliver an addictive groove-death metal punctuated by the harsh yet melodic vocals of singer Johannes Eckerström. I know Johannes offstage, but wasn’t quite prepared for the transformation that takes him over as he enters as the insane clown-faced Ringmaster. With a wildly enthusiastic crowd, the swedes played a mix of old favourites and their new album, with obviously more than a few loyal fans in the audience singing along to each of the songs. With songs ringing in my head, I took a break to find food and a drink before heading back into the tented areas for a little Cryptopsy. 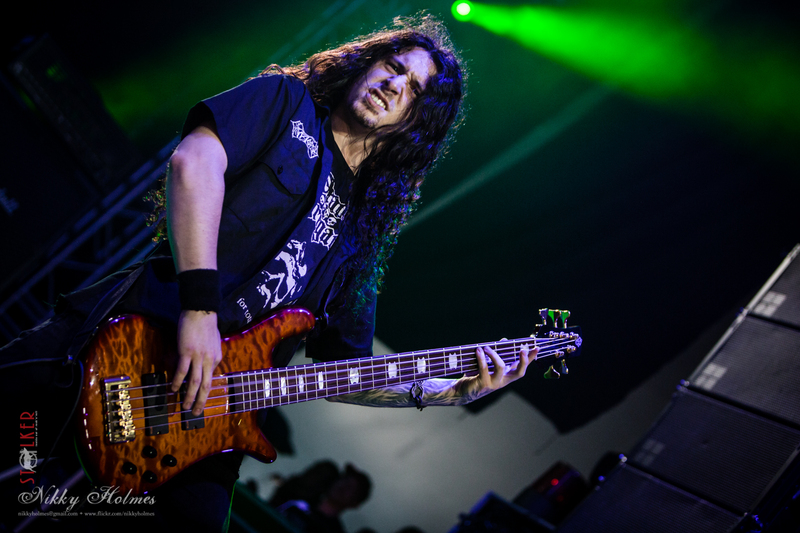 Cryptopsy deliver a technical death metal unforgiving and brutal in it’s approach. People who dislike metal will often complain about ceaseless guitars and vocals so rough and deep that they’re almost incomprehensible… well that’s the Canadian’s approach and they’re making no apologies about it. Not that their loyal fans would wants to, with many open clenching hands raised throughout the audience as they were assaulted from the stage. Often a sucker for a good press release, I decided to see where all the fuss about teenage guitar prodigy Nik Kai was coming from. 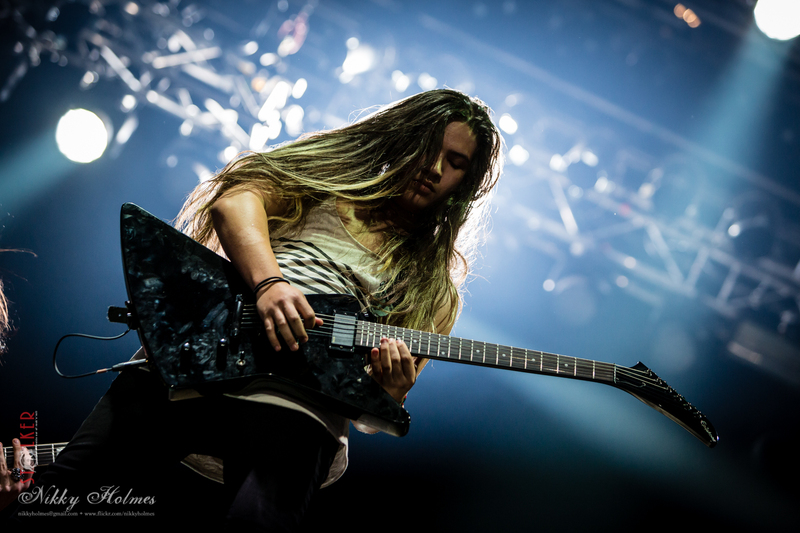 Fourteen year old Nik has been making waves on the scene as a prodigy since about 10, after picking up the guitar at 9. Yes, he’s a talented youngster. 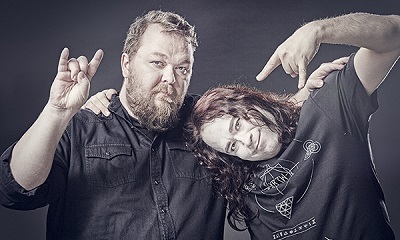 However, I feel the publicity machine will have to work harder as he gets older, or put him with a band that grabs a little more buzz in order to keep his name rising up the metal scene. A signing by the Mötörhead label will count, but let’s see how the awkward teenage years treat this young developing talent. 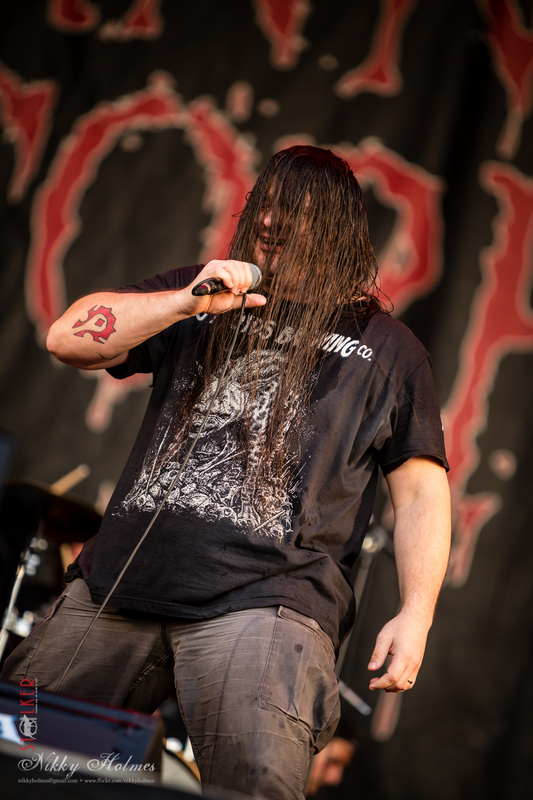 From young talent to established, my next port of call was the legendary Cannibal Corpse. Following the strong release of A Skeletal Domain last year, Cannibal Corpse are still putting on a strong show 27-years since they formed in Buffalo in the late 80s. Known for their horrifying album covers, these Death metallers have found a cult following for good reason. They’re just bloody good live. In fact, so good that the crowd-surfers were coming in steadily. The security were worked hard as metalhead after metalhead were delivered feet first to the front of the stage, some repeatedly. Fists pumping, and hair flailing, it is clear that Cannibal Corpse gain new fans year after year to swell the ranks. It’s also clear that some of these fans were World of Warcraft fans like singer Corpsegrinder, as Horde symbols were in heavy evidence in the crowd. I’d like to make a callout at this stage to the lovely staff of Imbizan Streetfood. 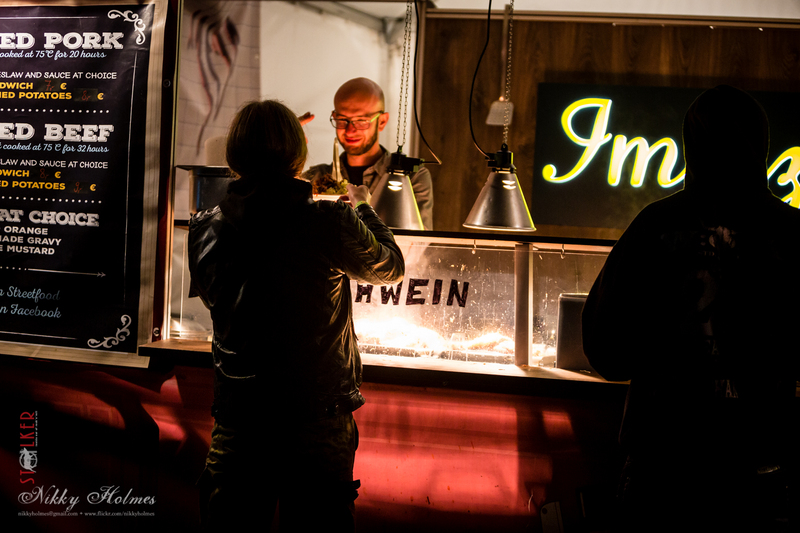 Though the vegetarian and vegan options were many in the hot food stalls of the Wacken areas, due to my food allergies without their stall I would have been relegated to eating hot chips all weekend, or cooking for myself for each hot meal at our campsite over a gas stove. I’d have hugged them, but they had a long queue for their excellent food and kind service, and I’m too short to reach over the glass. I enjoyed the cannons and fireshow of Sabaton from the crowd, who were playing with all the energy and performative energy they are well known for. I also saw Judas Priest this way to put up my mud-coated gumboot feet to enjoy a drink with good music. It seems that all the sound problems from earlier in the previous day were gone, and now the sound was great from most places on the inner field. 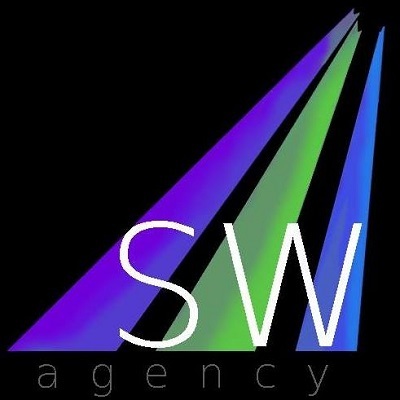 One of things many anticipate each year, is the festival organisers thanks and announcement of the next year’s Wacken. You see, all this mud? No one really cares. It’s something to talk about, something to prepare for, and something to laugh about when you get home. The risk of a wet muddy festival, or a dry dusty festival, doesn’t deter the Wacken metalhead at all. Sold out before I even got back to Finland from the festival, the announcements included Blind Guardian, Ministry, Steel Panther, Eluveitie, Dragonforce and more. (LINK HERE) We can also announce that Iron Maiden will be playing Wacken 2016, so if you don’t have a ticket yet we highly encourage finding a way there, as there is always a way. However, my Wacken 2015 was not yet over. 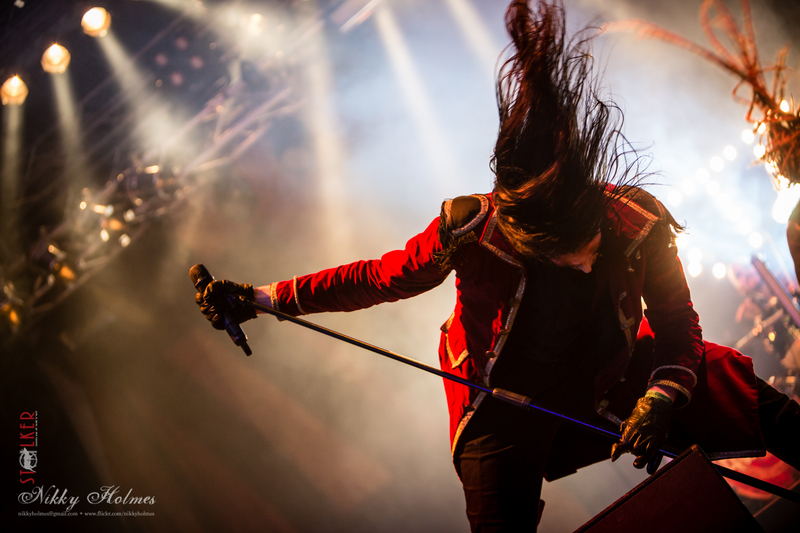 I was queued at the photographer’s entrance, gripping a little paper slip in my hand that would allow me in to photograph a song and a half of Cradle of Filth and I was bouncing about it. 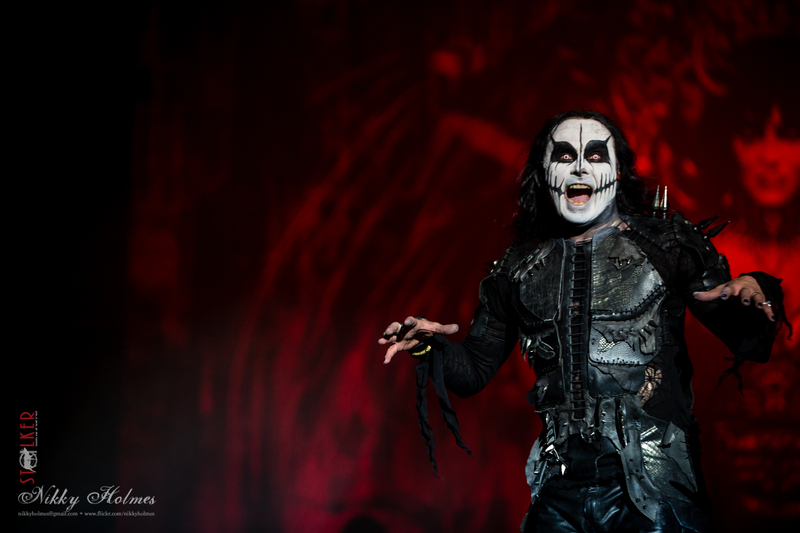 Cradle of Filth are known well for their extreme metal and shock imagery, but also for the attention and dedication they have to their fans. Every time I see Cradle of Filth, I am instantly brought back to my teenage years as a goth when they were high on my music rotation. That they haven’t compromised at all since then, and turning the lens on them at Wacken was a real pleasure considering the first time I developed a roll of concert photography film, I was listening to Dusk… and Her Embrace with friends in the photography labs at University. Wacken was not ended yet for a lot more metalheads as there were still a few more bands to go, the bars were still serving, and there were still friends to find before the morning came. That said, packing up the next day to drive away was almost sad. The semi-permanency of a 6-days in a camping spot faded as car after car queued to leave the grounds, and I heard more than a few people calling to leaving friends that they would see them next year. I’m sure they will, because if Wacken lures you in once, it will again.